A 529 plan is a college savings vehicle for parents, grandparents, and anyone else who wants to help pay for a beneficiary’s college education. Funds are deposited into a 529 account and then invested until the money is withdrawn to pay for tuition or other qualifying education expenses. Tax-Deferred Growth – capital gains, dividends, and interest are not taxed when paid or incurred inside of the account. Tax Free Distributions – if the funds are withdrawn to pay for qualified education expenses, there is no tax due on the distributions. As a result, the 529 Plan does provide a tax shelter, but also must only hold funds an investor is sure will be used towards education. If the money is not used for education penalties and taxes may apply. Here is a helpful Q&A from the IRS that may answer initial questions. Who is Aware of the Benefits of a 529 Plan? Unfortunately, not many people. In a recent study, only 29% of Americans could correctly identify what a 529 Plan is used for. On top of that, this number declined compared to the 32% result from this same study done in 2017. 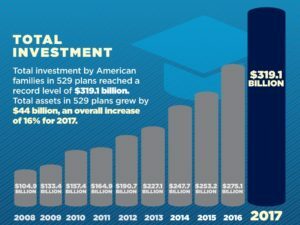 The bright side is that total assets invested in 529 Plans have been steadily increasing over the last decade and were at their highest level ever in 2017 at $319.1 billion. This is happening, however, at the same time enrollments and the costs of education are steadily increasing. These trends in admissions and expenses emphasize the need for families and individuals to take advantage of the substantial value-add of 529 Plans. There is a large suite of options available to those wishing to enjoy financial success now and in their future. Yet because of this large number of strategies, many often are unaware of their options. 529 Plans are a perfect example of one such strategy but when properly acknowledged, understood, and executed, they can be an important part of the right person’s overall financial plan. Next Next post: What Happened in the Stock Market Yesterday?